I knead an awful lot of bread dough. Most of the time I use my stand mixer because it's easy. Sometimes I knead by hand because I like the hands-on experience when I'm in the mood. Once in a while I use my food processor, just because it's different. And on occasion, I use a bread machine. Just recently, I found yet another kneading method. 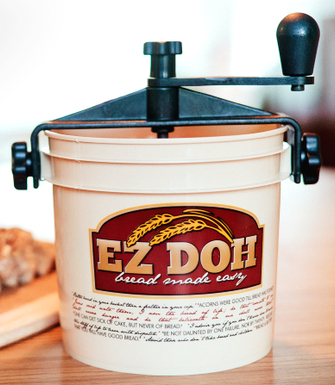 The dough maker comes with a recipe printed right on the bucket, but there's no reason you couldn't use your favorite recipe. I tried it with a few of my favorites with no problems. While kneading dough with this wasn't as easy as letting a stand mixer do all the work, I was surprised that it wasn't all that hard to crank. Certainly not as hard as using a hand-crank ice cream maker. And, unlike an ice cream maker, you can stop kneading the dough whenever you like if you get tired of cranking. Actually, it seemed to work better with stop-and-start cranking, and the results were just as good as other kneading methods. One major reason I think this would be good for new bread-kneaders is that there's a tendency to keep adding more and more flour to the work surface during kneading, which adds more and more flour to the bread dough, often resulting in a dense dough and heavy bread. With a device like this, it's unlikely someone will add extra flour, so recipe proportions are less likely to go off-kilter. Just for the fun of it, I tried kneading a batch of pasta dough in the EZ DOH. It did a fine job with the initial mixing, but once the dough became cohesive, the dough tended to gather on the hook and stay there. But still, I persevered, reversing the kneading direction and occasionally stopping to pull the dough off the hook. Of course, since the dough was much denser than a bread dough, the cranking was a little more difficult, but not impossible. Whether this device is easier than hand-kneading depends on your kneading skills and physical ability. Cranking is a different movement that requires different muscles than you'd use for hand-kneading, so it could be great for people who have difficulty kneading by hand. And, since all the kneading is contained in the bucket, it can be done anywhere. No need to be standing at the kitchen counter. Or standing at all. For folks who want their kids to get involved or who have helpful guests underfoot, the helpers don't need to know how to knead to use this. For people who don't like handling dough, this is a mostly hands-off process - you still need to get the dough out of the bucket and shape it, but that's about it. I don't think I'm going to abandon my stand mixer for this, but it does offer an interesting alternative. While the dough hook and crank are made from plastic, they seem pretty sturdy, so this should have a long life with normal use. The bucket is plastic that could crack after a while, but replacements are inexpensive - just $3.95 at the EZ Doh site. The bucket is top-rack dishwasher safe, but it's a bit tall to fit mine - but that's fine - it's easy enough to hand wash. The hook/crank section is supposed to be hand-washed. Who's it for: People who don't have a stand mixer and don't want to (or can't) do hand-kneading. Pros: It's simple, lightweight, and kneading skills aren't required. Cleanup is easy. Cons: At nearly $40, this is best for someone who knows they're going to want to knead dough regularly. If you're looking for lots and lots of bread recipes, be sure to check out my recipe site, Cookistry. I like it. And I have a stand mixer. But sometimes I think my dough is too heavy for my stand mixer. Do you know what I mean? have a mixer and don't have the strength to knead.